I got this refusal letter: 1- It seems to me the ECO has not understood my blocking account status that is 8740 Euros. 2- I am a student in Germany, I have obtained the money in both my blocked account and my personal current account in Iraq where I worked for 5 years. 3- I am fully sponsored by my fiancee, but he has ignored this and the evidences with it. What shall I do? It is really important to me to visit her for these three weeks, because here in Germany I live in a shared flat. It is not possible for her to come and live with me here. if I reapply explaining my financial situation, do I have a chance of getting it? I appreciate your kind responses. Browse other questions tagged uk visa-refusals proof-provenance-of-funds or ask your own question. 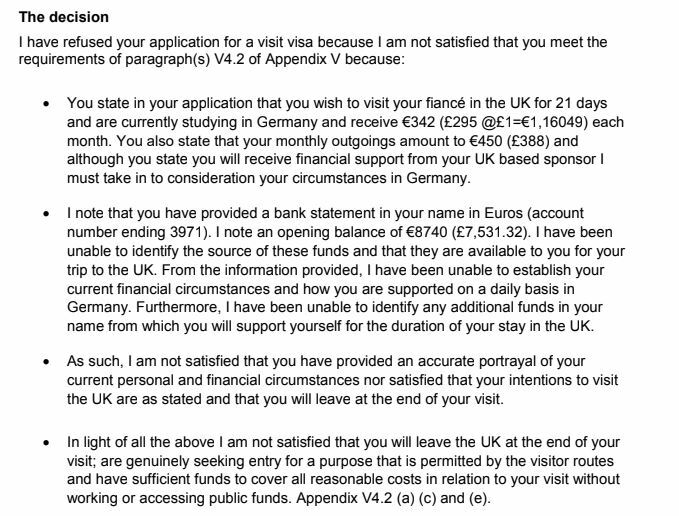 UK Standard Visitor Visa refusal for lack of evidence on funds - how to reapply?